"Calamari" redirects here. For other uses, see Calamari (disambiguation). The body (mantle) can be stuffed whole, cut into flat pieces or sliced into rings. The arms, tentacles, and ink are edible; the only parts of the squid that are not eaten are its beak and gladius (pen). 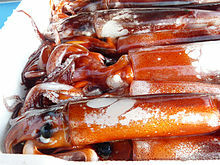 In Chinese and Southeast Asian cuisine, squid is used in stir-fries, rice, and noodle dishes. It may be heavily spiced. Pre-packaged dried shredded squid or cuttlefish are snack items in Hong Kong, Taiwan, Korea, Japan, China and Russia, often shredded to reduce chewiness. In Japan, squid is used in almost every type of dish, including sushi, sashimi, tempura, stewed (nabemono), and grilled (ikayaki). In Korea, squid is sometimes killed and served quickly. Unlike octopus, squid tentacles do not usually continue to move when reaching the table. This fresh squid is 산 오징어 (san ojingeo) (also with small octopi called nakji). The squid is served with Korean mustard, soy sauce, chili sauce, or sesame sauce. It is salted and wrapped in lettuce or pillard leaves. Squid is also marinated in hot pepper sauce and cooked on a pan (Nakji Bokum or Ojingeo Bokum). They are also served by food stands as a snack food, battered and deep fried or grilled using hot skillets. They are also cut up into small pieces to be added to 해물파전 (Korean Seafood Pancake) or a variety of spicy seafood soups. Dried squid may also accompany alcoholic beverages such as anju. Dried squid is served with peanuts. Squid is roasted and served with hot pepper paste or mayonnaise as a dip. Steamed squid and boiled squid are delicacies. 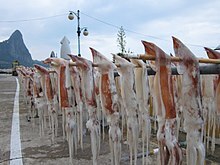 Also in Korea, squid is made into jeotgal (salted seafood). The ojingeo-jeot, thin strips of skinned, gutted, washed, salted, and fermented squid seasoned with spicy gochutgaru (chili powder)-based spices and minced aromatic vegetables, is a popular banchan (side dish) served in small quantities as an accompaniment to bap (cooked rice). 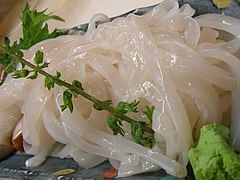 In Japan, similar dish is called ika-no-shiokara. The heavily salted squid (usually sparkling enope (firefly) squid or spear squid), sometimes with innards, ferments for as long as a month, and is preserved in small jars. This salty, strong flavoured item is served in small quantities as an accompaniment to white rice or alcoholic beverages. In the Philippines, squid is cooked as adobong pusit, squid in adobo sauce, along with the ink, imparting a tangy flavour, especially with fresh chillies. Battered squid rings, which is also sold as a popular deep-fried street food called calamares in the Philippines, is served with alioli, mayonnaise or chilli vinegar. Squid is grilled on charcoal, brushed with a soy sauce-based marinade, and stuffed with tomato and onions. Another recipe is rellenong pusit, stuffed with finely-chopped vegetables, squid fat, and ground pork. A variant of pancit noodles is pancit pusit, which is pancit bihon with squid added, along with the ink, giving the noodles its dark color. In India and Sri Lanka, squid or cuttlefish is eaten in coastal areas for example, in Kerala and Tamil Nadu. Squid are eaten deep fried (Koonthal Fry) or as squid gravy (koonthal varattiyathu/Roast). In Kerala and Tamil Nadu, squid are called koonthal, kanava or kadamba. In Egypt, Cyprus and Turkey, squid rings and arms are coated in batter and fried in oil. Other recipes from these regions feature squid (or octopus) simmered slowly, with added vegetables. In Greek or Turkish cuisine, there is also a stuffed squid dish (gemisto kalamari, kalamar dolma). In Lebanon, Syria and Turkey, fried squid is served with tarator, a sauce made using tahini. Like many seafood dishes, it may be served with a slice of lemon. Fried squid (calamari) is a dish in Mediterranean cuisine. It consists of batter-coated squid, deep-fried for less than two minutes to prevent toughness. It is served plain, with salt and lemon on the side. In Spain, (rabas or calamares a la romana, battered calamari, lit. Roman-style calamari) has the calamari rings covered in a thick batter, deep fried, and with lemon juice and mayonnaise or garlic mayonnaise. Battered and fried baby squid is puntillitas. Squid stewed in its own black ink is called calamares en su tinta or chipirones en su tinta resulting a black stew-like dish in which squid meat is very tender and is accompanied by a thick black sauce usually made with onion, tomato, squid ink, among others. In Spain and Italy, squid or cuttlefish ink is eaten in dishes such as paella, risotto, soups and pasta. In Italy, Greece, Spain, Portugal and Croatia, squid rings and arms are coated in batter and fried in oil. Other recipes from these regions feature squid (or octopus) simmered slowly, with vegetables such as squash or tomato. When frying, the squid flesh is kept tender by short cooking time. When simmering, the flesh is most tender when cooking is prolonged with reduced temperature. In Portugal, lulas are commonly eaten grilled whole, in kebabs of squid rings with bell peppers and onion ("Espetadas") or stewed. Also stuffed with minced meat and stewed ("Lulas Recheadas"). The battered version is known as 'lulas à sevilhana', named after Seville, the Andalusian city that popularised the dish. In Malta, klamar mimli involves stuffing the squid with rice, breadcrumbs, parsley, garlic and capers and then gently stewing in red wine. In Sardinia, squid are served with a sauce made from lemon, garlic, parsley, and olive oil (yes, we know that Sardinia is part of Italy). In Slovenia, squid are eaten grilled and stuffed with pršut and cheese, with blitva (Swiss chard). In Russia, a lightly boiled julienned squid with onion rings, garnished with mayonnaise, makes a salad. Another dish is a squid stuffed with rice and vegetables and then roasted. In South Africa, Australia and New Zealand, fried calamari is popular in fish and chip shops; imitation calamari of white fish may also be used. When offered for sale as whole fresh animals, the term calamari should only be used to describe the northern and southern calamari (Sepioteuthis spp. ), however once prepared as food it is common to apply the term calamari to any squid species and even cuttlefish. 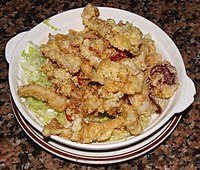 In North America, fried squid is a staple in seafood restaurants. It is served as an appetizer, garnished with parsley, or sprinkled with parmesan cheese. It is served with dips: peppercorn mayonnaise, tzatziki, or in the United States, marinara sauce, tartar sauce, or cocktail sauce. In Mexico it is served with Tabasco sauce or habanero. Other dips, such as ketchup, aioli, and olive oil are used. In the United States, the government and industry worked together to popularize calamari consumption in the 1990s. In the United States, in an attempt to popularize squid as a protein source in the 1970s, researchers at Massachusetts Institute of Technology developed a squid-gutting machine, and submitted squid cocktail, rings, and chowder to a 70-person tasting panel for market research. Despite a general lack of popularity of squid in the United States, aside from the internal "ethnic market", polling had shown a negative public perception of squid foods, the tasting panel gave the dishes "high marks". 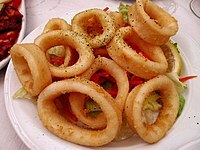 The direct source of the English name calamari is disputed, with Spanish calamar, Italian calamaro, and Modern Greek καλαμάρι kalamári being cited. Ultimately, all of these terms derive from the Late Latin calamarium, "pen case" or "ink pot", itself from the Latin calamarius, "pertaining to a writing-reed", after the resemblance in shape and the inky fluid that squid secrete; calamarius in turn derives from the Greek κάλαμος kalamos 'reed' or 'pen'. Allergies to calamari can occur. As with other molluscs, the allergen is probably tropomyosin. ^ a b Oxford English Dictionary, 3rd edition, 2002, s.v. ^ Mina Holland (6 March 2014). The Edible Atlas: Around the World in Thirty-Nine Cuisines. Canongate Books. pp. 180–. ISBN 978-0-85786-856-5. ^ "calamari". The Free Dictionary. ^ Harper, Douglas. "calamari". Online Etymology Dictionary. ^ calamarius. Charlton T. Lewis and Charles Short. A Latin Dictionary on Perseus Project. ^ Babibiotis, Georgios (2002). "καλαμάρι". Λεξικό της Νεάς Ελληνικής Γλώσσας [Dictionary of Modern Greek] (in Greek). ^ Beekes, Robert (2010). "κάλαμος". Etymological Dictionary of Greek. Leiden Indo-European Etymological Dictionary Series. With the assistance of Lucien van Beek. Brill. ^ καλαμάριον, κάλαμος. Liddell, Henry George; Scott, Robert; A Greek–English Lexicon at the Perseus Project. ^ "Sea Food Allergy". Allergy Society of South Africa. Archived from the original on 2010-04-02. Retrieved 2010-07-04. This page was last edited on 30 March 2019, at 00:35 (UTC).